“A mistake and a chance encounter lead to an unlikely friendship. Bear is settling down for a quiet, cozy Christmas reading by the fire, happy to be alone, when he hears a car horn outside. 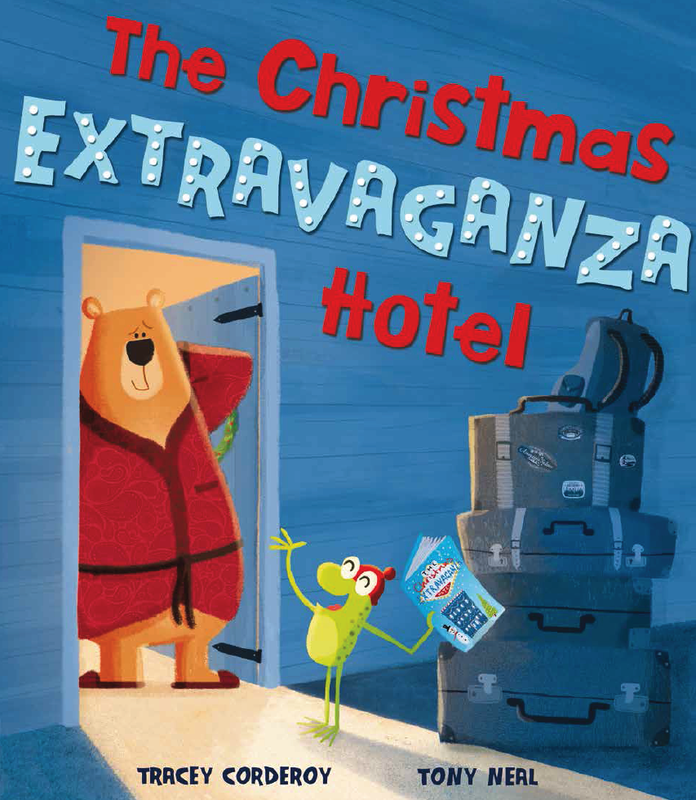 He opens the door to find an exuberant frog with luggage piled high, expecting a “Christmas EXTRAVAGANZA!” complete with a “supersonic sleigh ride.” A quick look at Frog’s upside-down map reveals that he’s on the opposite side of the world from his vacation destination. Bear kindly offers to let Frog stay with him, but the next day he realizes that he’ll have to think of creative alternatives to the activities in Frog’s brochure. They bake iced cookies to replace an “all-you-can-eat North Pole breakfast bar.” Who needs a singing Christmas tree when there’s a gigantic outdoor tree sparkling with real snow, its height emphasized by a vertical two-page spread. Best of all, viewing the northern lights from a hillside more than makes up for missing the gaudy light display at the hotel. The two characters, temperamental opposites, end up appreciating each other’s gift of friendship. The book’s large, square format gives ample room for cheery, expressive illustrations. Bear and Frog so obviously enjoy each other’s company that their differences fall away as they find the joy of newfound friendship. Buy it here in the US or here in the UK. Or why not buy it at a local bookshop? Click on the link to the right to find one.